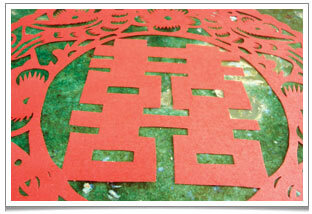 Paper cutting of Double-Happiness at Chaya Teahouse to celebrate the Royal Wedding. 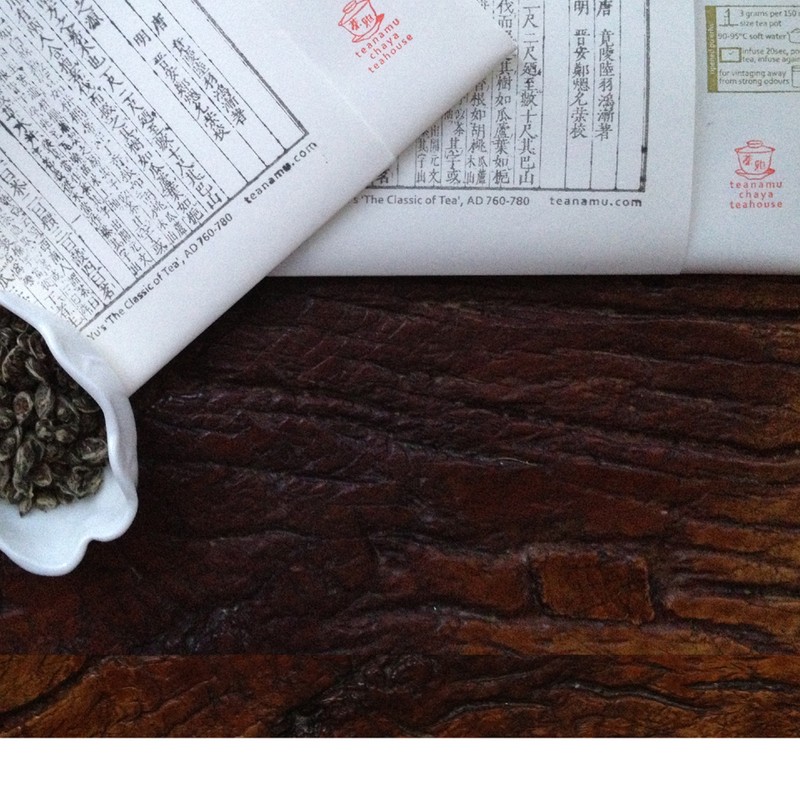 Wedding bells are in the air this Spring, so I thought a blog post about tea in Chinese weddings would be appropriate! The tea plant has long been closely associated with Chinese wedding rituals. As Lang Yin (郎瑛) wrote in a famous treatise during the Ming Dynasty period (1368-1644) tea was an auspicious article apt for use in weddings, having been elevated from an ordinary everyday drink. Lang Yin pointed out that tea was cultivated through the fertilisation of seeds and therefore it was possible to symbolically liken it to the concept of marriage (‘cong yi‘, 从一, ‘union’ or ‘devotion’). In later centuries people came to refer to engagements or betrothals as ‘shou cha‘ (受茶) and engagement gifts (such as gold, jewellery, fine clothing or food) as ‘cha jing‘ (茶金) (‘cha’ of course meaning ‘tea’). There grew up myriad regional rituals about how much of each kind of gift to give, but good quality tea leaves were invariably an important part of the ‘cha jing‘. – Brew the ripened Pu Erh or dark oolong tea. and pour the tea into the cup. – Let infuse for 1-2 minutes. On the day of their wedding day a couple will eat a sweet soup comprising lotus seeds (‘lianzi‘, 莲子) and red dates – a ritual, known as ‘ding cha‘ (‘setting tea’) , which symbolises the ‘sticking together’ of both their hearts and their hope of having a male child as soon as possible. After entering the bridal chamber, the couple then enjoy a cup of ‘hehuan cha‘ (合欢茶), representing a life of conjugal bliss . In Hainan Island (the so-called ‘oriental Hawaii’!) – where my grandparents came from – the countryside is much poorer than in many other parts of China, and my ancestors would have used only local produce for a wedding feast. Still today, betel nut (‘bing lang‘, 槟榔) is a ‘must have’ for wedding gifts – also known as 定情之物 (‘ding qing zhi wu‘), i.e. an item that couples give to each other as a sign of love. 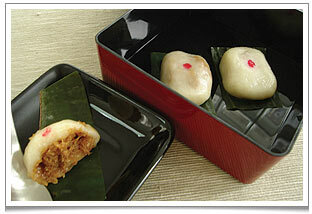 Another ‘must have’ food item is the ‘yi buah‘ (in the Hainanese dialect, 意粑). It is a steamed, glutinous rice pastry, amply filled with grated coconut that has been candied and caramelised in palm sugar, steamed in a banana leaf case. More remote relations will make loads of these pastries and offer them to the happy couple’s close family to congratulate them on the auspicious occasion. We’re excited to be re-creating this delicious classic of ‘yi buah‘ at Chaya Teahouse on the weekend of the Royal Wedding, so do pop along (Saturday, Sunday or bank holiday Monday, 12-6pm) and try it for yourself!! On the third day of the marriage, the new couple go back to the wife’s parents’ home, whereupon a tea ceremony is typically held for the new couple to pay respect to the wife’s parents (if this has not already been done on the wedding day). The wife’s parents give the couple, in return, a cockerel and a hen, together with other gifts such as tea, jewellery, pastries and other food items. This pair of birds will be cared for as pets until they die. Some other food items are commonly eaten at a Chinese wedding – all usually revolve around 3 main themes. First, the colour red, considered auspicious, thus Chinese red dates, for example. Secondly, sweet fruit to signify a sweet and mellifluous relationship, thus candied winter melon, candied persimmon and dried longans. Thirdly, foods whose name contains any character that sounds like ‘zi‘, as this is the character for ‘son’ or ‘boy’, thus lotus seed (‘lianzi‘, 莲子) or melon seeds (‘guazi‘, 瓜子). ‘Lianzi‘ in particular is a ‘must have’ as ‘lian’ also has the same intonation as the character that means ‘continual’ (连). The entire wedding process is very long and rigorous and can last many months from the first matchmaker meeting to a few months after the wedding ceremony. It can vary widely from region to region. One of the main events is the wedding tea ceremony, which has its origin in the general tea drinking culture of China and specifically in the highly important, symbolic act of ‘respectfully offering tea’ to one’s guests or elders. After making an offering of tea and incense to the gods and demi-gods and the family ancestors, a new couple will kneel in front of their parents and family elders (basically anyone older and already married) and bride and groom will offer up to each person a cup of tea. The tea has been prepared just prior to the ceremony and typically uses a dark oolong or ripened pu erh with the addition of all the auspicious items like Chinese red dates, “Baihe” lily bulbs and “lianzi” lotus seeds. The matchmaker, as master of ceremonies, recites auspicious greetings as the tea is offered up. After drinking their tea, each elder gives a red packet (‘hong bao‘, 红包) filled with cash or jewellery. The tea ceremony is really a sign of respect and a thank you to the parents for bringing up the couple. In many older people’s minds, the couple’s matrimony is only recognised and really accepted by the family after the parent has drunk the tea. This is an extremely important event as many will, literally, not consider the couple ro be part of the family unless and until this tea has been offered and drunk. There are a few crucial thing for the wedding tea ceremony. One has to be very careful not to drop the tea cups. Breaking them on the ground would be considered highly inauspicious, though an experienced matchmaker would immediately say ‘luodi kaihua‘ (落地开花, ‘hit the ground and blossom’) and everyone in the room would repeat the same phrase. A sweet superstition and one that turns even potential misfortune into good fortune, which I think is a lovely philosophy!